One of the most important sources to the Landscape Archaeologist investigating the landscape of Medieval Sherwood Forest is the 1609 crown survey and map by Richard Bankes. This survey was commissioned for the newly crowned James I, and undertaken by the surveyor Richard Bankes in, or just before 1609. It consists of a written survey of all the freehold land within the forest, and an accompanying map. The map for the southern section of Sherwood Forest- known as 'Thorneywood' survives- unfortunately the maps for the 'High Forest' to the north and that for the area known as 'Rumwood' are now lost. It is the earliest cartographically accurate depiction of the landscape of the forest, and unlike the earlier 'Belvoir map' depicts fields, roads, villages and rivers in a manner familiar to the modern reader. It also lists all the occupiers of land within the forest boundary (these people will be listed in various entries to come soon). The map and survey are of huge importance for understanding the landscape and administration of the forest at the end of the medieval period- they catch a snap-shot of the landscape at a time when royal influence was beginning to dwindle, as powerful landlords came to dominate the area in the 17th century. The Civil War of 1642-51 would dramatically alter the power structure of the forest. It would also see vast areas of woodland cut down to fuel the war effort, and due to the collapse of Forest Administration at that time. The dissolution of the monasteries in the 16th century had altered land ownership with many powerful magnates occupying land previously in Monastic hands. This process would mature in the 17th century, where men like the Earl of Newcastle took over the great royal manor of Mansfield and many of the royal centres in the forest. He would become both Keeper of Sherwood Forest and Justice in Eyre for the Forests North of the Trent at the same time. 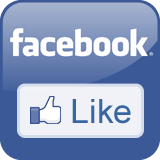 As well as the major landholder in the 'High Forest'. So this map and survey is significant as it gives us a window into the forest as it was before these major changes. It is also useful as a stepping-stone back to far older times- and combined with historic documents and other sources has formed the background of the Map of medieval Sherwood Forest created by Alan McCormick and myself with Nottinghamshire County Council. In many other parts of the country 15th and 16th century enclosure of the great open fields altered the landscape- masking to an extent the earlier shape of things. 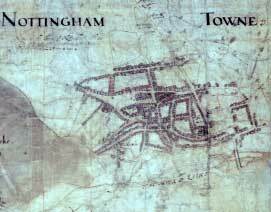 This was recorded in a survey from the 16th century known as the Domesday of Enclosures for Nottinghamshire (this will be discussed in an entry soon). The Forest Law seems to have lessened the impact of these enclosures on Sherwood Forest than in other areas. This means that the 1609 survey offers a better view than would be the case for a non-forest area. The 1609 crown survey then, offers a fantastic view of the late Medieval landscape. It also offers a chance for Landscape Archaeologists and Historians to rebuild the Earlier landscape of Medieval Sherwood Forest. The creation of the medieval landscape is vital, as it forms the backdrop for any serious study of the medieval Forest- giving us a landscape to populate with the characters and events of the time. The maps were redrawn by Peter Burgess, and the survey was edited by Steph Mastoris and Sue Groves in 1998 for the Thoroton Society (see bibliography). The oldest literary reference to Robin Hood comes from the medieval poem Piers Plowman by William Langland and dates from the year 1377. However the use of the surname ‘Robinhood’ predates this considerably. From the early 1980's onwards a number of ‘Robinhood’ surnames have been found in 13th century documents. All of those found so far date from 1261-1290. This is a hundred years earlier than the Piers Plowman reference. 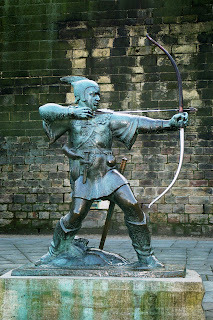 This suggests that the legend- or the term ‘Robin Hood’ was in use by the second half of the 13th century at least. Any original Robin Hood must therefore have been operating before or around this time. 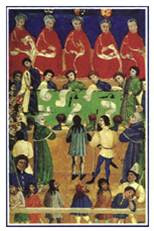 The notorious Folville gang operated in the early 14th century and were mentioned in Piers Plowman within a few years of their exploits (see outlaws page for more information). John Rabunhod was charged with others in 1272 with murder- after a quarrelsome brawl in a tavern near Fareham, Hampshire; he had fled and was outlawed. And a William Robehod who appeared in 1261-2 in Berkshire as a member of an outlaw gang suspected of robberies and of harbouring robbers. Coincidentally, along with these ‘Robin Hoods’ in a 1292 a Little John and a Petit Johan were both appealed of robbery. Of all these surnames the most significant is William Robehod of 1261. His entry into history was discovered by David Crook formerly of the National Archives and former editor of the Transactions of the Thoroton Society. William Robehod is listed for the crime stated above in the King's Rememberancer's Memoranda Roll of Easter 1262. By a chance survival the crime is also recorded in the roll of the Justices in Eyre for Berkshire in 1261. Here William Robehod is actually revealled to be a William son of Robert le Fevere. The Clerk in the 1262 roll had changed his name to Robehod!!! Therefore the name in this instance is a nickname and not a surname. (Crook 1987). Was Robin Hood a nickname for any 'Robbing Hoody'? Or was this clerk familiar with a legend already widely in circulation in 1261? Whatever the reason the entry is incredibly significant as it means it would be very difficult if not impossible to be sure of the authenticity of any earlier ‘Robinhood’. 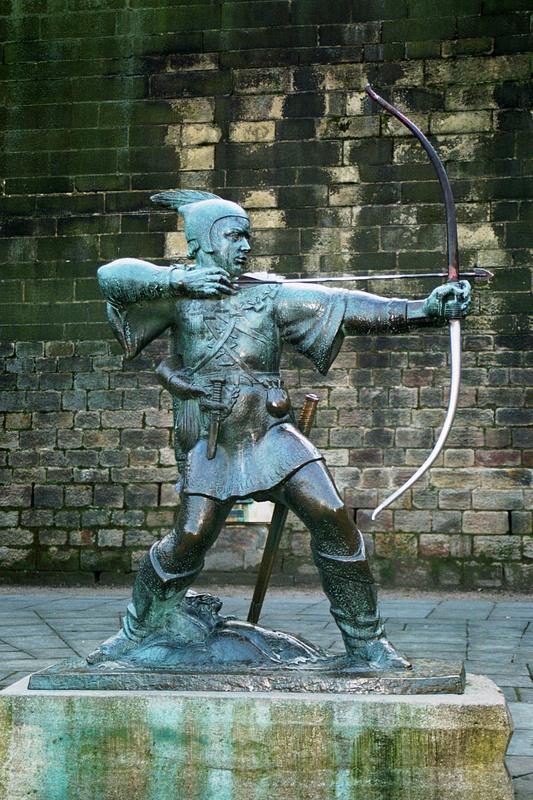 There are earlier names that could be the original Robin hood. A 1225 entry for a Robert Hod on the Pipe Roll, with the form Hobbehod used in 1226 exists, and will be the subject of a future entry. But it could well be that the fame of Robin Hood may also be the insurance of his permanent obscurity (Holt 1989). 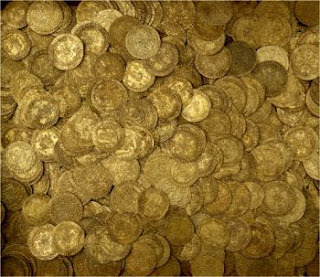 In 1966 the largest ever hoard of medieval gold coins was unearthed in the middle of Sherwood Forest. This collection of 1,237 coins, four rings, four peices of jewllery, and two lengths of chain (Cherry 1973) dates from the reign of Edward IV (1460-83). 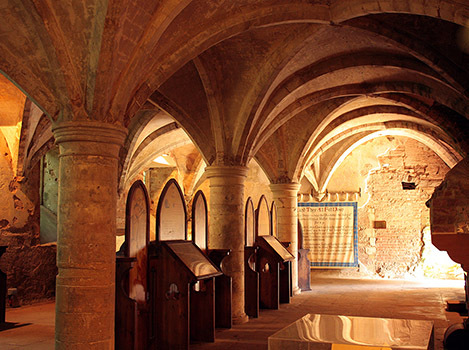 It was deposited between winter 1463 and summer 1464 during a rebellion against Edward by supporters of Henry VI. Edward IV and Henry VI fought in the Wars of the Roses and swapped places twice as king. Henry VI reigned from 1422-1461, and from 1470-71. Edward VI reigned from 1461-1470, and then from 1471-1483. 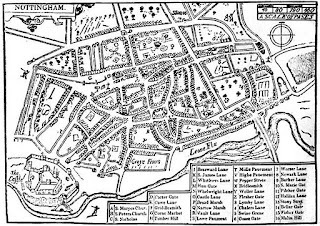 It was a chaotic time, where nobles changed sides and the different houses of York and Lancaster (the descendants of the sons of Edward III) had periods of differing fortunes. This chaotic background seems to have lead to panic enough to warrant somebody depositing a collection of coins with a value at the time of £400. £300,000 in todays money (British Library). In a hole in the ground! It has been suggested that the coins were deposited in an extreme emergency. The money may have belonged to the royal treasury and may have been entrusted to a loyal follower fleeing the battle of Hexham where oposition to Edward IV was effectively crushed in 1461. The location chosen for this hasty burial was to the east of the western highway through Sherwood Forest. It must have been difficult to trust anyone. The nearby Newstead Priory was the usual choice as a safehouse for items of value (although nothing on the scale of this hoard ). It was not chosen in this instance. Maybe the loyalty of the monks could not be assured. Instead an area of woodland close to the fishpool of the village of Blidworth was decided upon. The name of the hoard comes from this location. The fishpool of Blidworth Blyworth fyspole was mentioned as a landscape feature on the Belvoir map of Sherwood Forest in the early 1400's. It was situated at the source of the Doverbeck River, which formed the bounday of the forest further south along its course. It is only possible to imagine the dramatic events of the time, and the level of panic that must have led to the deposition of such a vast amount of treasure in the woods and wastes of medieval Sherwood Forest. Hunting was a very imporant social activity for the Crown and aristocrats, and for the gentry and landowners who sought to emulate them in the medieval period. In Medieval Sherwood Forest who had the right to hunt, and what for was very very important. Many of the higher clergy had exemptions from forest law- and the right to hunt in the Forest. The Forest laws enshrined who had the right to hunt the 'Beasts of the Chase' -namely the king with a few rare exceptions. This right was jealously guarded by the crown. Alongside the 'beast of the chase', there was another classification of animals subject to hunting- the 'beasts of the warren'. 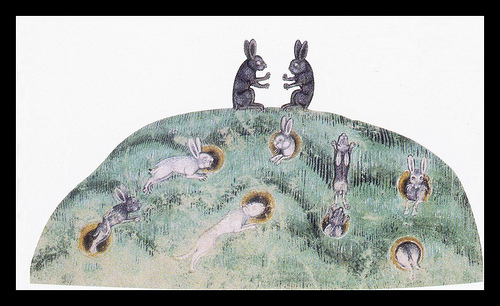 The right to 'Free Warren' was principally the right to hunt hare and fox in particular places and at particular times, often granted by the king as reward or favour. 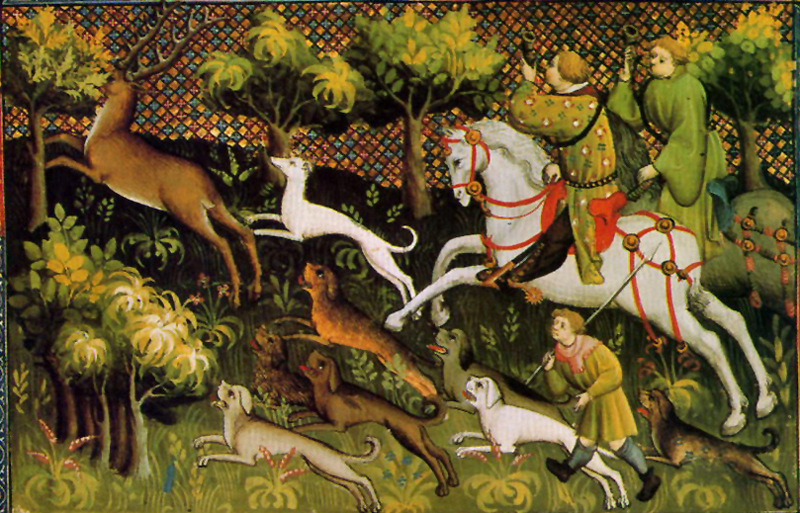 The right to hunt these animals was considered a signal of status amongst landowners and aristocrats. Many Lords sought to establish these rights over their land. In medieval Nottinghamshire in the 12th century the only listed person having a right to Free Warren was the Bishop of Lincoln (Crook 2001). He was extremely powerful in the valley of the River Trent being the builder and custodian of Newark castle, the impressive fortress built to guard the crossing of the Great North Road over the River Trent. 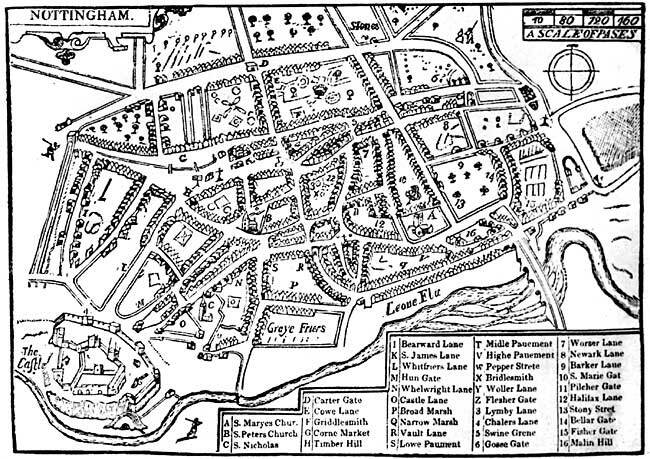 During the 12th century the Forest extended all the way to Newark in the East, (see boundaries page)and the Great North Road ran through the Forest of Clay and up across the district of Hatfield to the north. The Bishop of Lincoln was granted the Kings warren over all the land he owned north and east of Newark, stretching into Lincolnshire, by Henry I. This amounted to a £10 fine for hunting in the warren illegally. The forest stretched over the whole of the county north and west of the Trent in the 12th century. In the 13th century- especially following Magna Charta in 1215, and the subsequent Forest Charter of 1217- the forest was removed from much of this area (see boundaries page for more details). Following this retreat- the number of Charters of Free Warrren granted by the King to landowners in the newly disaforested area increased dramatically. This was first documented in 2001 by David Crook- formerly of the National Archives and former editor of the Transactions of the Thoroton Society. In his paper he recorded these charters and demonstrated their relationship to the removal of forest law from the area. There were no Charters of Free warren granted within the area of Sherwood Forest that remained under forest law. The following statistcs are from his paper Crook, D. 2001. The Development of Private Hunting Rights in Nottinghamshire, c1100-1258. Transactions of the Thoroton Society, 105. In the period 1225-1257 33 lords secured charters in at least 69 places around the county. At least 50 of these were in areas disafforested in 1227. Alongside those named above- it also seems that the Knights Hospitaller of the order of St John of Jerusalem, enjoyed the right to free warren over their lands of Kirkby Hardwick- and that they may have acquired this right from the Knights Templar (see Kirkby Hardwick and the warrior monks entry for more details). In conclusion it seems then, that landowners and lords wished to gain the status associated with a Charter granted by the king to the right to hunt Beasts of the Warren on their land. 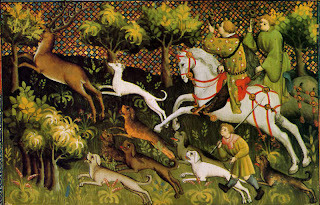 Within the forest it was still illegal to hunt the Beasts of the Chase, but in the newly disaforested areas available in the 13th century many lords sought to emulate the the King and prove their status by gaining this Charter of Free Warren. As pointed out by Crook- this also gives us another level of evidence as to where the Forest jurisdiction had lain in the 12th century.